One of the biggest challenges in implementing a project such as One Laptop per Child in a community school in the developing world is that it needs to be supported in a sustainable way. This is an even greater challenge for a nation-wide deployment, as in Nepal. Placing one laptop per child in a school is only the beginning - indeed may only happen long after the beginning! The first step is to involve a broad range of people from the beginning. OLENepal was started by Rabi Karmacharya and Bryan Berry in August 2007. From the beginning it worked directly with the Nepal Department of Education. A Board of Directors was recruited from respected members of the community in Nepal including educators. In the first year beginning in April 2008, laptops would be deployed to two schools near enough to visited easily. Each child in classes 2 and 6 in the two schools would receive a laptop. OLENepal would provide educational activities to supplement the existing textbooks in two subjects: Mathematics and English. Each of the two schools would have a schoolserver which would be connected to the internet via a local service provider. The important point is that the deployment was limited so that the process could be proven before a wider deployment was attempted. Even so, preparing the educational materials proved more time consuming than anticipated and during the school year OLENepal worked intensively to provide them before they were required. The schoolserver, especially using ejabberd to support collaboration, proved more challenging than expected and, truthfully, the servers were not used for much of the first year. Internet access also proved more difficult than expected since both schools needed directional radio links to the provider. All of this was made much more challenging by the Nepal power grid which tries to meet the growing demand for electricity with limited capacity by shutting off the power for several hours each day. Before school opened in April 2008, teacher training sessions were held for the teachers in classes 2 and 6 in each school plus the principal and specialist teachers in mathematics and English. The training was held offsite in Nepali presented by Nepali educational specialists from OLENepal for seven days followed by three days in-class training after school started and the laptops had been distributed. For most of the teachers, it was their first experience in using a computer. A critical part of the training was a one-day session for the parents at the time the laptops were distributed. In the school year beginning in April 2009, the deployment plan was more ambitious, but still controlled. The number of schools expanded from two schools in one district to twenty-seven schools in six districts. The scope was expanded to include English, Mathematics, and Nepali in classes 2 and 3 plus English and Mathematics in class 6. The number of deployed laptops was expanded from less than 200 to more than 2000. The Nepal Department of Education provides teacher training centers in strategic locations throughout Nepal. A special training was set up in the Kavre district near Kathmandu so that both the teachers in the three schools in Kavre but also educators from the teacher training centers could attend. This allowed the educators from the training centers to take responsibility for the training sessions in the other five districts. The educational materials developed by OLENepal take the form of Flash animations. These are presented via the Flash plugin for Firefox. Firefox is packaged as a Sugar Activity (E-Paath). The E-Paath activities are organized by class, subject and week (based on a 30 week academic calendar). Each activity is accompanied by teacher notes and a lesson plan (both in Nepali). E-Paath grew in content and sophistication as the first year proceeded. Important improvements were made and continue to be made as the direct result of classroom use. In the second year, the schoolserver plays a more significant role. E-Pustakalaya, an electronic library currently containing several gigabytes of content is stored on the schoolserver. It is available to the XO by another incarnation of Firefox as a Sugar Activity. 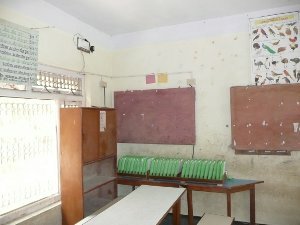 This technique makes both E-Paath and E-Pustakalaya more accessible to younger students who don't have to deal with the complexities of selecting links, tabs, and typing in search text. OLENepal was very fortunate in that high school students graduate too late for the normal university admissions process in the United States, United Kingdom, Australia, and India. As a result they have a year off between. Several of these students, graduates of prestigious private schools in Kathmandu, volunteered to work full-time preparing to support the deployment. Eight of the volunteers were organized in teams of two to support the deployment in each of the four districts remote from Kathmandu. Initially they performed tasks in support of the OLENepal staff such as repairing laptops while also learning Linux, Python, the Sugar Activities, and E-Paath. They participated as colleagues with the OLENepal staff learnig to communicate by IRC chat, email, wiki, and trac. As the time of deployment approach, they were committed to two tasks: prepare the laptops for deployment and prepare to support the teacher training and laptop distribution in their districts. The laptops themselves arrived in two air shipments - 300 boxes containing 5 laptops each on pallets. The UN World Food Program provide space to house the laptops and to prepare them for distribution. Preparation became a very intensive assembly-line process. The boxes containing laptops for each district beginning with Kavre were opened. The laptops were removed from the packaging and united with their charging adapter. The next step was to test each laptop (receiving inspection) using the test-all feature of the firmware (something which is extremely valuable and not well publicized). Units which passed were then connected to charging stations (the others were placed on a DOA rack with a tag identifying the reason). Each laptop was then loaded with the OLENepal version of Sugar (NEXO) by nandblasting. Since the 'nandblaster' continues to cycle broadcasting the contents of each block of Nand, laptops could start receiving the broadcast anywhere in the cycle and be removed whenever they completed the cycle. Once nandblasting was complete, the laptop was identified (using a permanent marker) and Bryan Berry recorded the serial number and identification number. After the laptops were repacked in the boxes, and the boxes identified by district and box number along with the identification numbers of the laptops in that box. It took a team of six all day to process 300-400 laptops fueled by lots of pizza. Meanwhile the Kavre teacher training was taking place. As a result these volunteers were shuttling between the World Food Program factory and the teacher training site. At the training, the volunteers were invaluable in working with individual teachers to help them over difficulties as they tried to use the XOs to try out the activities discussed in the training sessions. This was critical since these teams plus an OLENepal staff member would attend to each of the training sessions in the other districts to support the Department of Education trainers. OLENepal maintains a staff of paid professionals plus volunteers. The leadership and staff are almost all Nepali. The skills required cover an amazing range - government relations to coordinate activities with the Department of Education and other sponsors, educators to plan the educational materials to support the school curriculum, designers to prepare the artwork, animators to prepare the Flash scripts, software engineers to integrate the activities with Firefox, the menu system, and Sugar, network engineers to enable school access to the internet, electrical engineer to design and implement the charging stations and to coordinate electrical needs with each school, and system administrators and software engineers to implement the schoolserver and ensure communication between the internet, the administration network between the schools, Department of Education, and OLENepal, and to support the infrastructure at OLENepal. You can learn more about OLE Nepal's work at http://olenepal.org/. Also, see "Tackling the Problems of Quality and Disparity in Nepal’s School Education: The OLPC Model": http://wiki.sugarlabs.org/go/File:SDBhatta-2008-OLPC_model.pdf. This story was contributed by OLPC Austria member and olpcnews co-editor Christoph Derndorfer based on information provided by OLE Nepal team-members. Special thanks to Tony Anderson, Bryan Berry, Rabi Karmacharya and Subir Pradhanang for their support during the process.